So just what are the necessary ingredients to make us fall in love with a film? This elusive formula has been discussed at length by strangers, friends and colleagues, but I recently had a lightbulb moment when I realized that for a film to grab me, heart mind and soul, it needs to redefine the concept of Hero. In the last six months, three films have successfully introduced me to a brand new kind of romantic hero. In Julian Schnabel’s Miral it’s Jamal, the unfaltering father who gives unconditional love, in Kiran Rao’s upcoming Dhobi Ghat it’s Munna, the unselfishly handsome dhobiwalla with a heart of gold and in Ruba Nadda’s Cairo Time it is Tareq, the self-sacrificing friend and unlikely companion we can’t help but fall head over heels in love with. Now they will be joined by a fourth ideal leading man: Johnny Marco. The late Indian filmmaker Manish Acharya brilliantly came up with this description for the perfect film character: “A character should enter a room, light it up, grab our attention, surprise us, challenge us, make us laugh, give us insight we’ve always guessed but never articulated and then, when you want more, when you least expect it…disappear.” It fits Johnny Marco (played to perfection by Stephen Dorff) the leading man in Sofia Coppola’s latest film Somewhere to a T.
To say that I’m a big fan of Coppola would be an understatement. She hit cinematic and emotional jackpot for me with Lost in Translation when she introduced us to a completely different kind of romantic hero, a figure she continues to reinvent in Somewhere. Her films blend modern day simple urban elegance with an “olden days” introspective calm, all mixed together to absolute perfection by a healthy dose of humor and voyeurism. 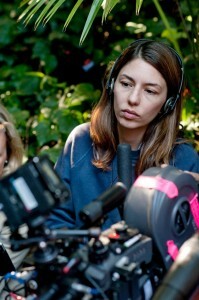 It isn’t so much that you watch a Sofia Coppola film, you live it, breathe it, see it, smell it, hear it, feel it. She’s one of the few directors out there who has the ability to bring in the sound designer along with her actors and crew during shooting and allow the genius of a Richard Beggs to work his magic. Just watch the scene where Johnny is getting a cast of his head made up at the studio and notice the claustrophobia of the soundtrack there to know what I’m talking about. From the first scene, which BTW has been mentioned in every single review of the film, of the black Ferrari going around in loops in the desert, to the very last shot -- you would have to torture me to give that away! -- Coppola has us spellbound. She is a Hollywood rockstar, making films for those who like a little thinking with our entertainment, but also need to make up our minds for ourselves. 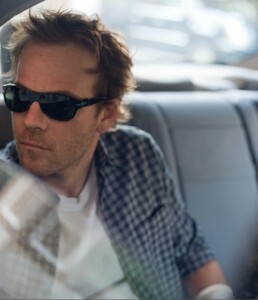 Johnny could be the typical unlikeable, pompous, drugged out movie star we are so used to seeing on the big screen, but instead Dorff plays him vulnerable and kind, aging silently and hopelessly sad. Until his eleven-year-old daughter Cleo (played by the super cool Elle Fanning) comes along and throws his world upside down. But that also does not happen in typical dramatic Hollywood movie fashion… With Coppola, it’s a quiet thing. To accompany that quiet, Somewhere comes with a wonderful collection of songs, a soundtrack that has kept me mesmerized for days after watching the film. Some of the song seem almost like an inspiration for the film, and one is left to wonder what came first, the film or the music. I’ve included a separate post with a list of the songs to purchase individually on ITunes, since the Somewhere soundtrack is not available there. But this way, you get to discover it for yourself and find some amazing musical talent you may have overlooked in the process. Somewhere was apparently the working title of the film until Coppola realized that it fit because “It was just this sort of vague idea that he [Johnny Marco] wanted to go somewhere else, but he didn’t know where exactly. It is just the idea of being somewhere other than he is.” Johnny is a movie star but he’s also completely alone, until Cleo comes along. His phone only vibrates with incoming nasty text messages, he lies in bed watching twin strippers pole dance for him with an expression only slightly more excited than a coma, his fingernails are chewed to the edge and he doesn’t even say a word until the film is well into its first 20 minutes. At a special screening in NYC, Dorff -- dashingly handsome in a down-to-earth way and wearing a chic black pinstripe suit -- revealed that Coppola writes her scripts in a completely different way from other filmmakers. She avoids directions in favor of a rough sketch with a specific feeling. She also helped her actors to create a bond with each other by having Dorff pick Fanning up from school one day and allowing them to construct their own personal moments together, which included painting pottery and Pinkberry yogurt, at Fanning’s request. The performances resulting out of this experiment in intimacy are quiet, truthful, gloriously understated and I was honestly surprised not to find either Fanning or Dorff on the SAG Awards nominations list. The theater-full of actors and SAG nominating members I saw the film with seemed absolutely enthralled by both stars and commented enthusiastically on the “realness” of their acting. Me, the hopeless romantic, was left to wonder if love is indeed all about romance or maybe a much more complicated explanation for companionship. Is romance just a fancy word for friendship, the kind of friendship that keeps your heart warm, your days occupied and your thoughts full? It is exactly this kind of thinking that Somewhere stimulates in the viewer and the reason I am still in its glow more than a week after watching it. Rounding out the film are wonderful supporting performances by Chris Pontius -- of Jackass fame -- as Johnny’s cousin Sammy, and a cameo by Benicio Del Toro in the Chateau Marmont elevator. Somewhere was initially inspired by the Fellini short film Toby Dammit -- part of the trilogy of Poe stories titled here in the US Spirits of the Dead -- and I can see how with the Ferrari references, all the untranslated over-the-top Italian characters in Milan and a girl who appears out of nowhere, though thankfully the films don’t end the same way. Somewhere also seems a very personal journey for Coppola, recounting what could easily be moments of her relationship with her father Francis Ford Coppola, but also magical instances in her own life as a celebrity. 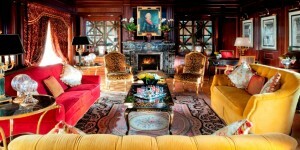 Who among us would not cherish staying at the Hotel Principe di Savoia in Milan, in their Presidential Suite complete with private indoor pool? But instead of showing off and making the film about that insider’s obsession of keeping outsiders out of her life and fortune, Coppola allows us, her audience, right in, to experience the place to the fullest. So much so that you’ll feel like settling your bill at the Chateau Marmont on your way out of the movie theater. Although Johnny is a lost man, alone in spite of his success, he grew in my heart at every turn because of his well-intentioned, kind-hearted manner. Cleo could be a spoiled brat with her upbringing and money, but she’s instead a gentle soul who appreciates her life and loves her father. It is the kindness of everyone in this film which left the biggest impression on me, more than a week after first watching it. There are a couple of warnings: Somewhere is not a film for the ADD generation because, like a good red wine, it needs time to breathe and take on its full body. It is also a film that will leave you with many questions unanswered, open to discussions, with friends over before said bottle of red wine, if you wish. Somewhere will also inspire a yearning need to visit LA, to breathe the air of the legendary Chateau Marmont, to experience that lifestyle, despite the downfalls. And most importantly, Somewhere will make you want to call your father… You’ll see. 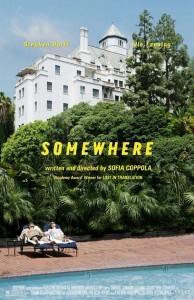 Sofia Coppola’s Somewhere opens in theaters nationwide on Wednesday, December 22nd. This entry was posted on Monday, December 20th, 2010 at 8:43 am and is filed under Film Reviews. Okay, so now I NEED to see this film. What a spellbinding review! I love ‘Lost in Translation’. It so well captured the experience of visiting Tokyo – the film captured exactly my feelings towards the one time I was there. 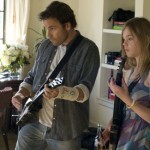 I look forward to seeing Sofia’s new film as I was the non-custodial father to my daughter and lived in LA.